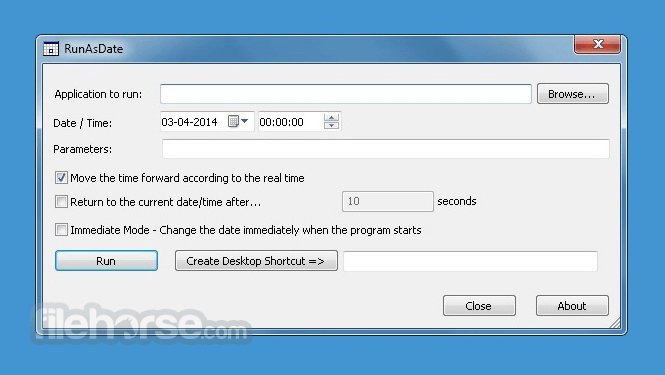 RunAsDate is a small utility that allows you to run a software in the date and time that you specify. This utility doesn't change the current system date and time of your computer, but it only injects the date/time that you specify into the desired application. You can run multiple applications simultaneously, each application works with different date and time, while the real date/time of your system continues to run normally. RunAsDate is a great software for desktop PC! RunAsDate intercepts the kernel API calls that returns the current date and time (GetSystemTime, GetLocalTime, GetSystemTimeAsFileTime), and replaces the current date/time with the date/time that you specify. RunAsDate doesn't require any installation process or additional DLL files. In order to start using it, simply copy the executable file (RunAsDate.exe) to any folder you like, and run it. 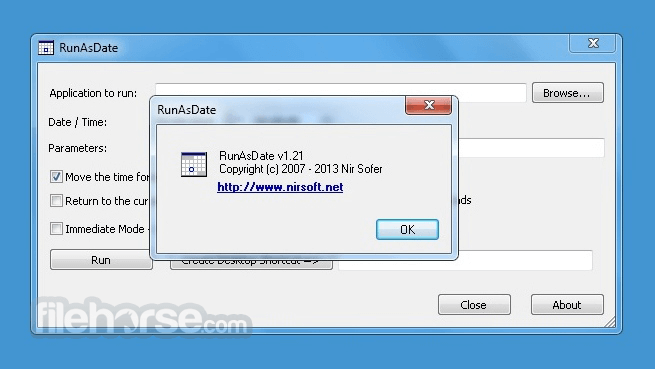 In the main window of RunAsDate, select the desired date and time and the application that you want to run. Optionally, you can also specify the command-line parameters to run the program. Press the "Run" button to start the application with the specified date/time.